If you've never been on a cruise liner before, you might be wondering: 'how do cruises work?'. If so, check out this article and find out the truth behind these seven myths. Click here for more info! If you ask the general population their thoughts on cruise vacations, the ubiquitous response may be more skeptical than enthusiastic. Yet, ask anyone who’s actually embarked on a river or sea voyage, and they’ll sing praises about this type of vacation. This is largely due to the many predisposed notions that surround ship travel, everything from “I get seasick” to “they’re too expensive.” Cruise travel, however, has evolved tremendously in even the last decade. With an abundance of diverse travel itineraries and no shortage of water for ships to trek through, cruises are a must for any traveler. If you’ve ever wondered “How do cruises work?” you’re in the right place. 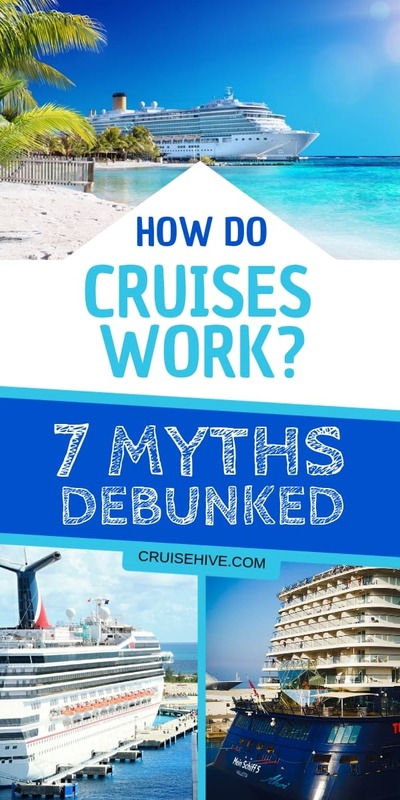 Learn the truth behind 7 of the most popular cruise ship myths. Quite the contrary, actually! Especially in recent years, cruise lines have been tailoring more and more to less conventional travelers. Family-friendly ships are quite popular, with options from major lines such as Royal Caribbean and Carnival Cruise Line. There’s even a variety of Disney-inspired ships for kids to feel (and adults to relive) that blissful magic. Beyond that, travelers can find tours that cater exclusively to young adults, solo adventurers, and even single parents. The average ship won’t be deluged with those old enough to remember Woodstock, and most cruises will have a great balance of people from all walks (and stages) of life. Another concern, especially among young travelers, is the lack of time spent in each port town. But, as frequent cruisers will tell you, you’re not going to be locked into the vessel the entire trip. In fact, many lines make stops ashore almost each day. Additionally, most cruise lines try to build their voyage off other must-see destinations. They understand their passengers want to take in as much off-shore as possible, and cruise lines are extending their time docked at ports of call to meet that demand, even adding overnight dockings or two-day visit in popular ports on some itineraries. But, if several hours isn’t enough for you, you should try a “cruise and stay” package. You can take advantage of one of the (sometimes complimentary) in-port options or create your own adventure to more fully explore an intriguing port of call. There are many anxieties one may have over cruise mealtimes. We always hear people say “I ate way too much,” given the around-the-clock dining options. However, there are two counterarguments to this belief. Most mid-size and resort ships have a gym or jogging area to help combat holiday weight gain, and a variety of fitness classes – from spinning and aerobics to yoga, pilates, or more energetic options, are often available. Furthermore, it’s vacation; it’s okay to eat and drink a bit more than normal. Many also believe the dinnertime is far too formal aboard most cruises. While this may have been true in years past, most modern ships offer a variety of casual options. Plus, many ships are modifying their accommodation policies to include open seating even in main restaurants to allow passengers more dining flexibility. Browse loads of cruise accessories from Amazon by clicking here. This one always elicits a laugh among frequent cruise-goers. You’d actually be surprised at the scarce amount of downtime one has while cruising. Cruise ships are packed with opportunities to learn new skills, discover new passions, or brush up on old hobbies. These activities allow most cruise-goers to have an enriching experience. Another awesome adjustment to many modern vessels is how specialized they’ve become. If you’re looking to fulfill a certain hobby, you can probably find a cruise that caters to it. There are art cruises, cruises for yogis, cruises with celebrities, and even trips for chefs. If you just want more casual fun, most cruise lines offer full activity schedules each day, including cooking demonstrations, trivia contests, karaoke, comedy shows, dance lessons, art auctions, deck games, movie screenings, and more. It’s true that bad weather can come out of nowhere. But, thanks to vessel stabilizers, it’s easy to combat those nauseous feelings. This new technology helps reduce the roll or motion of a ship. Ship captains also take steps to avoid bad weather whenever possible to help keep the ship safe and guests comfortable. If you’re still worried, you should try a cruise that stays close to shore. Also, there are transatlantic ships that are better suited for mild weather. Opt for a ship that’s intended for ocean travel, not cruise travel. If you know you’re prone to seasickness, you should still take some precautions. Use whatever medicine helps you or even try a pressure band. There is also medical personnel onboard at all times who can help if need be. Get your motion sickness bands from Amazon right here. Vacation is a time to unwind, and it’s hard to do so when you’re constantly battling the crowds. But, cruises aren’t as congested as you may think. Most ships have a variety of indoor and outdoor venues to hang back and enjoy your company. You certainly don’t have to stay in your room to find a little peace and quiet on a cruise, either. There are many onboard areas dedicated to relaxing, including libraries, solariums, spa facilities, and adults-only decks. Furthermore, meeting other passengers isn’t necessarily bad, and it’s not uncommon for travelers to make new lifelong friends who share their love of cruising! For most of us, travel decisions and vacation plans are based on what is financially feasible. It’s understandable one would immediately toss out cruise ideas, given all the options for budget-friendly land-based travel. However, once you start tallying cost for food, amenities, entertainment, etc., you’ll see cruises aren’t so bad. In fact, cruises are usually far less expensive than a regular vacation due to how much can be included in the cruise fare. Plus, you can usually find “all you can eat” or “all you can drink” packages to further offset the cost, depending on your vacation preferences. Try to travel during the off-season for the absolute best value. Stop Wondering “How Do Cruises Work?”- Join One! There are plenty of mistaken beliefs that surround cruise travel. If you’ve ever wanted to see how do cruises work, the best way to learn is to experience one yourself! Cruises are a unique and memorable way to see a new location and experience new things. At Cruise Hive, we can’t get enough of onboard travel! That’s why we work to share all the know-how and to-dos for both new and experienced voyagers, to let you discover the amazing voyages that await on every ship setting sail. If you’re looking for more information as a new cruise-goer, check out some more cruise tips.